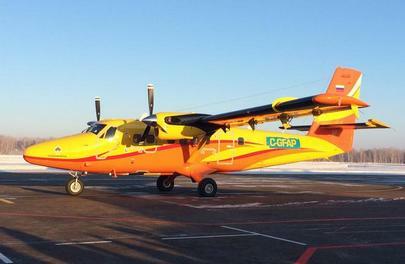 Krasnoyarsk-based AeroGeo has become the authorized maintenance center for DHC-6 Twin Otter Series 400 aircraft. Twin Otter producer, Viking Air, awarded the Russian operator the appropriate endorsements in mid-April, Viking Air’s representative Konstantin Barabash told Russian Aviation Insider. Notably, AeroGeo is the second organization in the world to be granted the title, after Swiss Zimex Aviation. Prior to approval, Viking Air conducted an audit and concluded that AeroGeo has the necessary facilities, equipment and personnel in place to provide MRO services, including those rendered by the OEM under the aftersales warranty terms. Other Russian operators of the type – ChukotAvia and Aurora – cannot provide such services. Aurora and ChukotAvia should find it beneficial to resource to AeroGeo for maintenance, because being an authorized service center makes the operator eligible for discounts on parts and components, Barabash emphasized. Other preferences may also be negotiated later on, he said. AeroGeo is also a service center for Pratt & Whitney, capable of providing MRO on the PT6A-34 engines that power the DHC-6 Twin Otter Series 400. The company has already been hired by Aurora to perform inspections on the engines for one of its Twin Otters. AeroGeo itself currently operates only one DHC-6, which is enlisted in its Air Operator Certificate for “aerial works”.